Viivi and Matteus were over from Finland visiting her aunt in Stockholm for a big family meal, when I interrupted their walk home. There was rain swirling about and a restless wind, but they kindly agreed to stop and shoot a few yards up a side street from where we’d met. Originally I’d intended to shoot this background with the car headlights reflected across the giant, sloping slate wall behind Viivi here. In reality, however, the light levels wouldn’t play and the results with reflected headlights were just too distracting. However, I’d asked Viivi originally for her pale grey outfit and bright features – hoping they’d play well with the charcoal backdrop. Fortunately this element of planning did work as well as hoped, hence (having removed a few red brake lights from the slate wall in Photoshop!) we have a portrait to show for our time together. 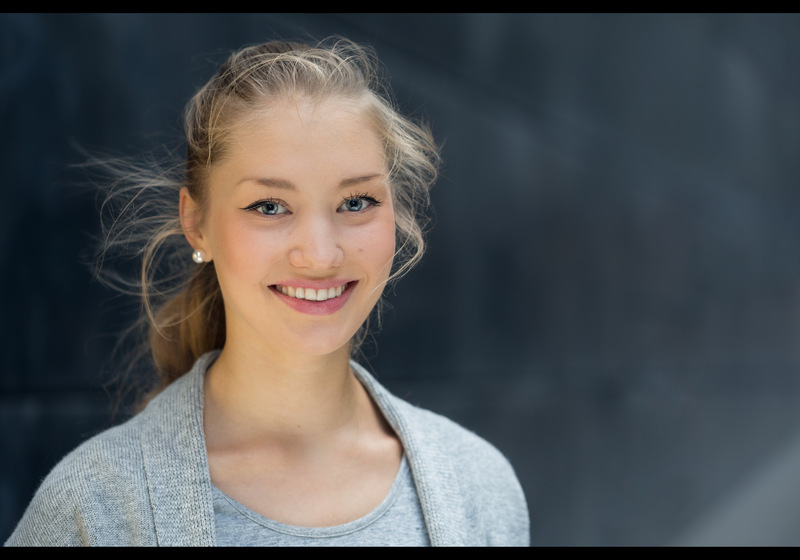 Viivi is a psychology student, navigating the increasingly difficult path of advanced study in Finland – where psychology places are fiercely contested. Meanwhile Matteus has military service to contend with before following his plans to become a fireman. The lighting is another two reflector juggle – Viivi has the sunfire disc and Matteus holds the giant gold reflector camera left. Once again, there’s a small fill pop from an on camera softbox. This is the kind of scenario where it really delivers – a paler subject needing a lift from a distant background. Thank you Viivi and Matteus for stopping, and for following up by email. It was great to meet you and I’m glad you like your portrait! Kiitos! This is portrait #67 of my 100 Strangers Project – check out the group page and get involved.